Webpage created: March 29, 2016. When Admiral Sir Charles John Napier KCB GOTE, Royal Navy, died on November 6th 1860, many seamen and Royal Marines decided that a memorial of some description was desirable to mark the fact that the Admiral had been a lifelong advocate of humane reform in the Royal Navy and had promoted the ideas of abolishing the press-gang and flogging and introducing proper pay and pensions for the seamen. The Admiral became more popular with the men than he was with the Admiralty. A subscription was thus raised from the men serving on the ships in Hamoaze and in time a sum of £156 was raised. It was decided to erect a memorial fountain and place it in Devonport "People's Park". It would appear that the Borough authorities were not asked about this but just told it was going to be done. Mr George Perkins, of Cumberland Street, Devonport, was chosen as the contractor, presumably by competitive tendering, and the terracotta pieces were ordered from Mr J M Blashfield, of Stamford, Lincolnshire. The Devonport Water Company supplied a pipe from the nearby reservoir (at a cost of £70) and the water was first switched on, as a trial, on Monday October 23rd 1863. 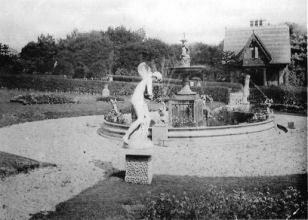 It is believed that the Fountain was officially brought into use on the anniversary of Admiral Napier's death, November 6th. Devonport Borough Council accepted the Fountain was a gift from the subscribers on Monday November 9th 1863. Sir Charles Napier took part in the Napoleonic War, the American War of 1812, and the Crimean War, and was also noted for designing a paddle-frigate, HMS "Sidon", which was launched in 1846. His earlier claim that he had proved that a ship could travel without the need of the wind was initially ridiculed by the Admiralty.